On 11 April, following six days of protests, a cabal of military officers, security chiefs and paramilitary commanders overthrew Omar al-Bashir. They were the president's most senior lieutenants and their intent is to keep the existing system intact along with the power and privilege they enjoy. The second announcement didn't come until well into Friday and was barely coherent, promising that the army would sponsor dialogue, and Bashir would be brought to court in Sudan. After both these statements, protesters vowed to continue their protests against what they decry as a stolen revolution. They see the military council's proposals as Bashir-ism without Bashir and they are right. Bashir's henchmen have simply replaced their boss with themselves. Before the events of the past week, al-Bashir had been toying with negotiating his exit, though as recently as two months ago had also been considering revising the constitution to prolong his stay beyond the 2020 elections. His enduring problem was that the political apparatus over which he presided is so complicated- in particular, the hydra-headed security forces are so fragmented - that he couldn't find a successor with both the loyalty and political skill to manage the system. His arrest warrant from the International Criminal Court (ICC) was an enduring obstacle to him formulating a viable exit plan. Nonetheless, in February, al-Bashir tested his well-honed political escapism skills for the last time. He imposed a state of emergency, dismissed civilian governors, and appointed a new deputy and heir apparent: former military intelligence chief, Gen. Ahmed Awad Ibn Auf. In the end, however, the president couldn't outlast the protesters. Worse, when agents of NISS and other militia used violence, army units stepped in to protect the demonstrators. The spectre of different armed units fighting one another on the streets of the capital became frighteningly real. Al-Bashir's chosen lieutenants - Vice-President Ibn Auf and NISS chief Salah Abdalla (aka 'Gosh'), along with Rapid Support Forces (RSF) commander Mohamed Hamdan (aka 'Hemeti') - decided he had to go. It is unclear whether the putchists arrested leading Islamists because they see them as a real political threat or as a strategy to curry favour with certain Middle Eastern backers. Either way, we can expect to see the new military council denouncing the demonstrators as Islamists to try to garner support from their patrons in the Gulf. The last few years have seen Sudan's Islamists split, with some joining the opposition and even the protesters. A second threat to stability will come from the putchists' clear attempt to abort the democratisation agenda. 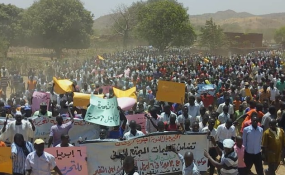 Sudan's demonstrators have proven their capacity for mass mobilisation and will not give in without major concessions, of which so far there have been none. The prospect of a massacre in the style of Cairo's Tahrir Square in 2011 remains. Or, one of the security chiefs could instigate chaos so as to justify a crackdown in the name of restoring order. Sudan's prospects are further complicated by the politics of the region. Al-Bashir had personal links with every Arab country and was able to manage a delicate balancing act. The men who seized power have, individually, close ties to different powers in the Arab world. Many in the army leadership including Gen. Ibn Ouf have close ties to Egypt. The paramilitary Rapid Support Force is deployed in Yemen on the Saudi Arabian payroll. Salah Gosh is closely aligned with the UAE. Some of the Muslim Brother leaders who have been dismissed or imprisoned are close to Qatar and Turkey, and even Iran. The military council won't be able to continue Bashir's balancing act. Instead, Middle Eastern rivalries will probably be played out within the higher ranks of the new regime, accentuating the power struggles and potential instability. It is unlikely that the Islamist regimes in Qatar and Turkey will accept their setback without responding: Sudan was the last place in the Arab world in which Muslim Brothers were in government. Meanwhile, Egypt, Saudi Arabia and the UAE will likely vie for the dominant position in terms of the sponsorship of their respective candidates. The 'Troika' of countries that helped steer Sudan's peace process 15 years ago - the US, UK and Norway - issued a statement earlier in the week calling for a transition to democracy. This was principally rhetoric, not backed by any substantive engagement. The US's Arab allies - Egypt, Saudi Arabia and the UAE - will press Washington DC to accept the fait accompli. Western countries will call for a more inclusive transitional council and faster moves towards democracy, but as long as there's no bloodshed on the streets, they're unlikely to become assertive. The most positive element in the current situation in Sudan is the extraordinary discipline and determination of large numbers of ordinary Sudanese. They have forced the downfall of a long-standing military ruler and demonstrated that they cannot be governed against their will. Any member of the Sudanese political elite who is able to capitalise on this remarkable demonstration of civic courage should be able to thrive. The new military council doesn't appear to have any such person: all are focused on short-term power calculations.